Soprano Karina Gauvin is one of Canada’s great lyric sopranos and, in the words of MCO Music Director Anne Manson, is “the greatest singer of Handel in the world.” A veteran star performer of the high-flown operas of Rameau, Cavalli, and Handel, her recital with the MCO clears away the powdered wigs and elaborate costumes to showcase one of the richest, nimblest, and most captivating voices of today. The Québécoise’s many decorations include ‘Soloist of the Year’ (Médias francophones publics), and she’s sung with the San Francisco Symphony, the Chicago Symphony, the New York Philharmonic and the Rotterdam Philharmonic as well as numerous leading Baroque ensembles. She may be “a queen of Baroque opera” (Opera News), but at our November concert you’ll hear her execute the vocal gymnastics of Mozart as majestically as the Queen of the Night herself. Alongside the MCO & conductor-bassoonist Mathieu Lussier, she performs no fewer than four works by Mozart — including arias K217, K369, and others from The Shepherd King and The Marriage of Figaro. As associate conductor of the Les Violons du Roy chamber orchestra, Mathieu Lussier has conducted over 100 concerts in Canada, Mexico, and the US. He’s also a gifted composer and bassoonist, in which roles he has engagements all over the world. Lussier teaches Baroque bassoon at McGill University and modern bassoon as the Université du Québec à Montréal. The concert begins at 7.30pm on November 6th in Westminster United Church, 745 Westminster at Maryland. Tickets, at $35 for adults, $33 for seniors and $15 for students and those under-30 (incl. GST), are available at McNally Robinson, Organic Planet (877 Westminster Ave), and on MCO’s Ticketline at 204-783-7377. A versatile musician with a commanding grasp of early repertoire, Mathieu Lussier is increasingly in demand as a guest conductor in Canada and abroad. Appointed by Les Violons du Roy as Conductor-in-Residence in 2012, and as Associate Conductor in 2014, Lussier has led the orchestra in numerous programs both in Québec, and on tour throughout Canada, the United States and Mexico. Previous appointments include Artistic Director of the Lamèque International Baroque Music Festival. In 2014, Lussier was awarded the Canada Council for the Arts’ prestigious Jean-Marie Beaudet Award in Orchestra Conducting. In the 2017/18 season Mathieu Lussier conducted the Kitchener-Waterloo Symphony in a program of baroque music. In 2016/17 he made his debuts with Edmonton Symphony Orchestra and Symphony Nova Scotia. Recent conducting engagements include the Festival International de Lanaudière, the Arion Baroque Orchestra, Orchestre Métropolitain de Montréal and Atelier Lyrique de l’Opéra de Montréal. He has also made guest appearances with the symphony orchestras of Sherbrooke, Trois-Rivières and Montréal. As a soloist appearing throughout North America and Europe, Mathieu Lussier has for nearly two decades energetically and passionately promoted the modern and baroque bassoons as solo instruments. He has performed with such ensembles as Arion Baroque Orchestra, Les Violons du Roy, Tafelmusik Baroque Orchestra, the Boston Early Music Festival Orchestra, and Apollo’s Fire in Cleveland. He devotes considerable time to chamber music as a member of Ensemble Pentaèdre de Montréal. 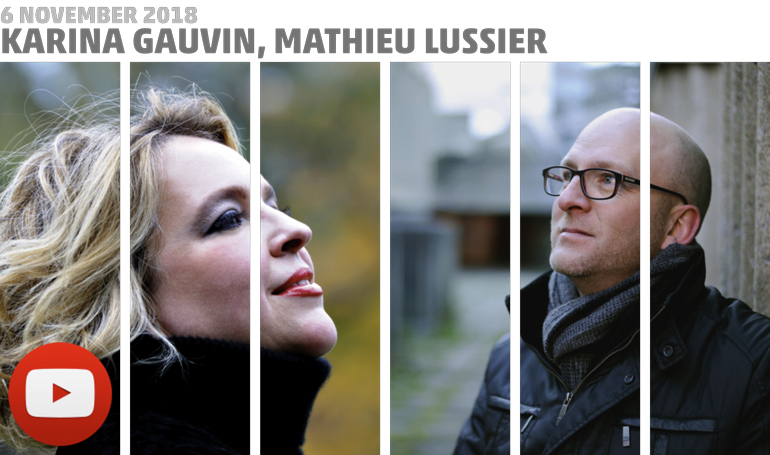 Mathieu Lussier is also a respected composer, with a catalogue of over 40 titles heard regularly in the concert halls of North America, Europe, Asia, and Australia. In 2009, his composition Bassango, in its version for bassoon and string orchestra, won the third prize in the Contemporary Classical Song category at the Just Plain Folks Awards in Nashville. Dos Tropcos, a wind quintet, has been performed over 100 times in Canada, Europe, and the United Kingdom. He has received commissions from artists such as Nadina Mackie Jackson, Guy Few, Lise Beauchamp, and George Zukerman, as well as from the American Wind Symphony Orchestra, Oshawa-Durham Symphony Orchestra, Tafelmusik Baroque Orchestra, and Les Idées Heureuses. Recognized for her work in baroque repertoire, Canadian soprano Karina Gauvin sings Bach, Mahler, Britten, and the music of the 20th and 21st centuries with equal success. The prestigious distinctions she has received include the title of ‘Soloist of the Year’ awarded by the Communauté internationale des radios publiques de langue française, first prize in the CBC Radio competition for young performers, and the Virginia Parker Prize and Maggie Teyte Memorial Prize in London. She has sung with the greatest symphony orchestras, including the Orchestre symphonique de Montréal, the San Francisco Symphony, the Chicago Symphony, the New York Philharmonic and the Rotterdam Philharmonic, as well as baroque orchestras such as Les Talens Lyriques, the Venice Baroque Orchestra, Accademia Bizantina, Il Complesso Barocco, the Akademie Für Alte Musik Berlin, the Tafelmusik Baroque Orchestra, and Les Violons du Roy. She has performed at leading venues worldwide—including the Barbican, Carnegie Hall, and the Concertgebouw—under the direction of Charles Dutoit, Michael Tilson Thomas, Bernard Labadie, Christophe Rousset, Alan Curtis, Sir Roger Norrington, Kent Nagano, Semyon Bychkov, Helmut Rilling and Yannick Nézet-Séguin. In addition, she has given recitals with pianists Marc-André Hamelin, Angela Hewitt, Michael McMahon, and Roger Vignoles. Karina Gauvin’s extensive discography of over 30 titles has won numerous awards, including a ‘Chamber Music America Award’ for her Fête Galante disc with Marc-André Hamelin, and several Opus Prizes. Her performances with the Boston Early Music Festival Orchestra earned her nominations at the GRAMMY Awards in 2007 and 2009. Her recent projects include a European tour and a recording of Ariodante (Handel) for EMI Virgin Classics, along with a European tour and a recording of Giulio Cesare for the Naïve House, both with Alan Curtis and Il Complesso Barocco. Future seasons promise to be exciting: she will sing Armida in Handel’s Rinaldo at the Glyndebourne Festival, Giunone in Cavalli’s Callisto at the Bayerische Staatsoper, Vitellia in Mozart’s La Clemenza di Tito at the Théâtre des Champs-Elysées in Paris, and Armide in Gluck’s Armide with the Netherlands Opera. Giovanni Palazzi’s rather complex libretto concerns the two sons of a sultan, offspring of separate mothers, who were switched at birth. The opera follows the complex resolution of their claims to the throne. Vivaldi launched the three-part overture with exceptionally forceful and dynamic music. It relaxes into a plaintive, pastoral section before concluding with a brief passage of renewed energy. Vivaldi composed more concertos for bassoon than for any other instrument (except the one he played himself, the violin), producing a total of 37 bassoon concertos, plus two unfinished sketches. He probably composed a handful of them for particular patrons and the rest for his students at the Ospedale della Pietà in Venice, the home for orphan girls in Venice where he worked. The solo writing in this concerto highlights two important facets of the bassoon’s personality: its agility and its ability to spin long, lyrical, virtually operatic lines. La Folia (The Folly, or Follies of Spain) is a type of wild Spanish or Portuguese folk dance. One traditional melody to which it was danced attained wide popular currency, beginning in the sixteenth century. Numerous composers have used it as a theme in sets of variations. The distinguished roster includes not only Vivaldi, but such other major figures as Arcangelo Corelli, Girolamo Frescobaldi, Jean-Baptiste Lully, Giovanni Battista Pergolesi, Francesco Geminiani, Johann Sebastian Bach, André Grétry, Luigi Cherubini, Franz Liszt, Carl Nielsen, Sergei Rachmaninoff, and Hans Werner Henze. Vivaldi’s first published music, a set of 12 Trio Sonatas, appeared in Venice in 1705. The final item in the collection is this set of 20 brief, artfully varied variations on La Folia. In Mozart’s day, composers regularly created arias for insertion into other composers’ operas. This was usually at the request of singers involved in reviving an earlier opera, who wanted something that would suit their voices better than the original music (and improve their chances of winning bravos). When the original composer was unavailable, impresarios gave the assignment to others. Mozart was called upon to perform this service on several occasions. He made contributions, usually without published credit, to operas by such internationally popular figures of the day as Pasquale Anfossi (Il curioso indiscreto), Francesco Bianchi (La villanella rapita), Domenico Cimarosa (I due baroni), and Martin y Soler (Il burbero di buon core). When Il curioso indiscreto had its Viennese premiere in 1783, scandal erupted after the only sections to find success were Mozart’s insertion arias. It should be noted that he also composed new arias for Viennese productions of his own operas: the local premiere of Don Giovanni (1788) and the revival of The Marriage of Figaro (1789). In addition to the insertion arias, Mozart composed other, stand-alone arias as gifts for his favourite singers to perform at concerts. The creation of these concert and insertion arias spanned virtually his entire career, from childhood to the final year of his life, and he wrote them in locations from London to Rome. In March 1781, he went to Munich to supervise the premiere of his new opera, Idomeneo. Following the successful debut, he composed this concert aria at the request of a gifted amateur singer, Countess Josepha von Paumgarten. The text comes from Ezio, a libretto by Pietro Metastasio that had already been set by numerous composers. The character Fulvia, blaming herself for the supposed death of her husband, implores the gods to strike her with a thunderbolt. The music opens with a melancholy introduction in which Fulvia bewails her cruel fate. The aria continues in this sad vein. The tempo accelerates in the final verse, leading to an exciting conclusion. On 7 March 1775, Mozart returned to Salzburg after a trip to Munich, to find an important commission awaiting him. His employer, Prince-Archbishop Hieronymous Colleredo, wanted a new musical drama to be performed during the upcoming visit of Archduke Maximilian. This youngest son of Empress Maria Theresa would be stopping over en route to Italy. Although Mozart’s primary responsibility as Second Konzertmeister of the Court Chapel was the creation of instrumental music, he had abundant and successful operatic experience, as well. The reason for the trip to Munich had been the premiere of his first comic stage work, La finta giardiniera (The Girl Disguised as a Gardener). The libretto for the Salzburg project had already been chosen: The Shepherd King, by Pietro Metastasio, Court Poet to the Empress. Completed in 1751, it had previously been set by at least a dozen composers (including the brilliant Christoph Willibald von Gluck), and several additional versions would follow Mozart’s. Given Mozart’s talent, experience and knowledge of what was expected in such a project, six weeks was more than enough time to complete the assignment. The first performance took place at the Archbishop’s palace in Salzburg on 23 April. His version was performed, probably in the concert or semi-staged style befitting a cantata-like serenata rather than a full opera, on the second day of the Archduke’s three-day stopover. Save for castrato Tommaso Consoli, brought in from Munich to sing the leading role of Aminta, the cast was drawn from singers of the Salzburg court ensemble. The following entry from the music-loving Archduke’s travel diary refers to the third evening, during which he took part in the performance by playing the violin: “at the end of the musique, the famous young Mozart was heard on the clavier and played various things by heart with as much art as pleasantness. Thus ended the stay, and because of the Archduke’s impending departure everyone retired early.” No reaction to Il re pastore has been recorded, nor does any record exist of it being performed again during Mozart’s lifetime. The first modern production was given in Salzburg in 1906. The text that Mozart set had been prepared for a performance in Munich the year before. It was performed with music drawn from the version that Pietro Alessandro Guglielmi had composed for a production in Venice in 1767. It compresses Metastasio’s three-act text into two; not a bad thing given its largely static nature. The action is set in Sidon, Lebanon, about 332 B.C. The city has been conquered by Alexander the Great (known here as Alessandro). He wishes to replace the deposed tyrant Stratone with the son of the rightful king. The prince was raised in secret, and without his own knowledge, as Aminta, a shepherd. He is in love with Elisa, a shepherdess. Once Aminta’s true identity is revealed to him, Elisa persuades him to agree, reluctantly, to present himself to Alessandro and claim the throne. Aminta (a male character performed in recent times by a woman) sings the tender aria in rondo form, L’amerò, sarò costante (I shall love her, I shall be constant), in Act Two. He is determined to forsake the crown, because it means less to him than his love for Elisa. A solo violin adds an extra touch of beauty and warmth to this selection. Soon afterwards, the opera ends happily when the wise Alessandro makes Aminta and Elisa rulers of Sidon, rather than imposing upon the new king the undesired love of Stratone’s daughter, Tamiri. The Spring Lullaby was composed in 2005, as a simple melody with chords, and orchestrated for Nadina Mackie Jackson in 2006 for her recording called Bacchanale (MSR Classics MS1201). Written like a song without words, its simple melodic line allows the bassoon to sing and dialogue with the solo strings of the chamber orchestra accompaniment. Lussier composed the sultry, tango-like Bassango in 1993. In August 2009, the bassoon and strings version received third prize for Contemporary Classical Song at the Just Plain Folks Music Awards in Nashville. The sixteen-year-old Mozart composed a set of three divertimenti for strings, of which K. 136 is the first, in his native Salzburg during the early months of 1772. He and his ever-practical, ever-ambitious father had recently returned from their second trip to Italy. Papa Mozart wisely felt that establishing a reputation in that most musical of lands could only enhance the likelihood of his son being able to develop his miraculous gifts to their fullest and most lucrative degree. Wolfgang arrived back in Salzburg bearing a commission for a new opera, Lucio Silla, which was to be premiered in Milan. Why he composed the divertimenti remains a mystery. He may have planned to take them along on his return trip, hoping like any clever, self-employed entrepreneur that they would (a) bolster his fame, especially since he had taken care to give them gracious, tuneful Italianate features that he felt sure would please that country’s music lovers, and (b) remove some of the pressure he felt likely to come his way to write such “occasional” music during the hectic period leading up to the new opera’s premiere. They share two unusual features: each has three movements, rather than the four or more that were typical of a divertimento or serenade, and they are scored for strings alone rather than the standard mixed-instrument ensemble. Mozart may have intended them to be performed by individual players as string quartets. It is possible that they are the works that his father, Leopold, offered to the publisher Breitkopf in February 1772—without success. In recent times they have been played most often by orchestral strings. No record remains of their first performances. One likely possibility is that they debuted in the luxurious private salon of Count Firmian, Governor General of Milan. Mozart had met this generous music lover during his earlier visit. What is known for sure is that Lucio Silla knocked ‘em dead when it first hit the boards on 26 December. Twenty performances followed before Mozart returned to Salzburg in March 1773. The D Major Divertimento has another Italianate connection: its succession of movements correspond to those found in the type of overture or sinfonia that introduced operas in Italy during that period. The bright and sunny opening movement (which is quite demanding for the violins) is followed by a warm, songful slow movement and a merry, breathless finale. Mozart and Italian librettist Lorenzo da Ponte collaborated on three outstanding operas that are still widely performed today: The Marriage of Figaro (1786), Don Giovanni (1787), and Così fan tutte (1790). The Marriage of Figaro was based on a play by the French writer Pierre Augustin Caron de Beaumarchais, a sequel to his earlier and hugely successful play The Barber of Seville. Various love affairs and romantic deceptions are resolved by the final curtain, but not before Count Almaviva’s servants, including his manservant, Figaro, have proven themselves as intelligent and sympathetic—if not more so—as he is. In E Susannah non vien! … Dove sono i bei momenti (Susannah’s not come! … Where are those happy moments), Countess Almaviva mournfully expresses the wish that her marriage with the Count could once again be as happy as it was during the early years. Mozart composed this piece (whose first line of text translates as ‘You have a faithful heart’) in a single day: 26 October 1775. It was an insertion aria for a new production of Le nozze di Dorina (The Marriage of Dorina), a three-act, twenty-year-old comic opera by the immensely prolific and popular Italian composer Baldassare Galuppi (1706-1785). In the 1720s, Galuppi had launched his own career by performing similar tasks with others composers’ operas. The plot, concocted by celebrated playwright Carlo Goldoni, is founded on a dispute between a count and a countess. They cannot agree on which of their servants shall marry Dorina, their orphaned chambermaid. Mozart’s aria is sung by the title character. She wonders aloud about the faithfulness of her intended suitor. The music accompanying her description of her lover is suitably dreamy. Once she turns the subject to his possible, even likely faithlessness, it switches to playful scorn. Mozart characterizes this emotion with spectacular and highly demanding writing for the voice.